Nicole is so awesome! It's not surprising, given her outgoing personality, she's been so successful in so many areas. This Q&A originally appeared on UCSF's Global Health Sciences website but I wanted to share it here since so many of you (prospective students) ask about global health opportunities. Before training as a pharmacist at UCSF, Nicole Nguyen developed an interest in global health as a health educator for HIV prevention, malaria, and sanitation workshops in Kiamuri, Kenya. Nicole furthered her career interests in global health, research, and teaching upon entering the Health Services & Policy Research pathway within UCSF's School of Pharmacy. During her training at UCSF, Nicole continued her exploration of global health while interning at the World Health Organization on projects relating to pharmaceutical policy research and access to essential medicines. In 2012, Nicole received her PharmD from UCSF and entered a yearlong training as a Pharmacy Practice Resident with UCSF. During that year, Nicole participated in the Global Health Clinical Scholars Program. Nguyen is now a Clinical Pharmacist at the UCSF Medical Center. What was your research focus while you were a Clinical Scholar? I developed an interest in the health disparities that stem from decreased access to medicine and became particularly concerned with Nigeria, due to its history of failed vaccination campaigns for polio. In collaboration with my mentor, Tina Brock, I worked on identifying the perceived barriers to vaccination for women's cancer prevention in Nigeria. I worked with the RISE Clinic in Nigeria and targeted health professionals in Anambra State to examine their perceptions of the barriers to HPV vaccination. What were some of the challenges you encountered in your fieldwork? Preparing for and implementing the study in-country was logistically challenging to coordinate in a short time frame (around four months for preparation and three weeks in-country), but having a motivated team at the RISE Clinic made it possible. Developing and nurturing the relationship with my in-country colleagues was key. During data collection I administered my survey to local health professionals and was well received by most, but there were a few encounters with individuals that challenged our intentions. The lesson I learned was to just try your best, be transparent, and be okay with rejection. What have you been up to since you finished the Clinical Scholars program in June 2013? In addition to working as a pharmacist at UCSF, I have continued to work on and disseminate my findings from the study I began as a Clinical Scholar. In the fall of 2013, I presented my work at the International Pharmaceutical Federation World Congress in Dublin, and I continue to work on the publication of the data. 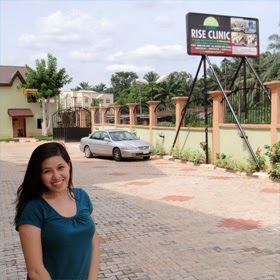 I continue to work with RISE Clinic on an educational campaign as the next phase of the project. How do you envision the future integration of global health with your career as a pharmacist? My goal is to pursue an academic career, one in which I can continue global health research, teaching and clinical practice. It is rare to see pharmacists successfully integrate global work within their clinical practice, but the Clinical Scholars program has made me better prepared and motivated to do it all. What advice would you give other pharmacists who are considering a career in global health? Seek out opportunities for training and collaboration that will provide field experience and contextualize some of the global health issues in low-resource settings. Make connections outside of pharmacy. Be flexible and creative in seeking opportunities. Before jumping into a global project, consider what unique skills you can contribute but prioritize the needs of the community. If done with thoughtful preparation, it can be incredibly fulfilling.